NJ trial attorney Adam Slater obtained a $3.9 million settlement on behalf of his client, a nurse, who sustained severe damage to her eye as a result of medical malpractice committed by her physician during a routine sinus surgery procedure. Because of the malpractice, Mr. Slater's client was unable to return to work as a nurse and suffers from double vision. The settlement represents one of the largest known payments of private funds ($1.9 million) in addition to insurance policy proceeds (2 million) to settle a medical malpractice case before trial. This substantial recovery is part of a long line of substantial settlements and verdicts obtained by Mr. Slater, who is a widely recognized New Jersey personal injury and medical malpractice lawyer. New Jersey trial attorney Adam Slater of the law firm Mazie Slater Katz & Freeman, LLC has obtained a $3.9 million medical malpractice settlement for a nurse who suffered severe complications, including extensive damage to her eye, resulting from negligently performed endoscopic sinus surgery, in Maria Kania v. Gangadhar S. Sreepada, M.D., Superior Court of New Jersey, Law Division, Passaic County, Docket No. PAS-L-1384-08. According to the facts of the case, the plaintiff was injured during the routine sinus surgery procedure, which was intended to clear sinusitis from the plaintiff’s maxillary sinus, when the surgeon instead operated in the ethmoid sinus, cut through the side of the orbit of the eye, known as the lamina papyracea, and then severed the medial rectus muscle, which stabilizes and moves the eye. The plaintiff underwent intensive surgical efforts to repair the damage, but the eye could not be fully repaired. She was left with permanent double vision, optic nerve and corneal injury, glaucoma, disfigurement, and chronic pain. In addition, the plaintiff was unable to continue her work as a nurse. The recovery is notable for the fact that the settlement payment includes the entire $2 million insurance policy limits available, as well as $1.9 million of private funds paid in addition to the insurance policy limits. This is one of the largest known payments of private funds in addition to available insurance policy limits to settle a medical malpractice case prior to trial, and was the result of Mr. Slater’s creative and aggressive approach to the case, assembly of a team of top medical experts to both prove the defendant’s liability and fully present all aspects of the plaintiff’s damages, and Mr. Slater’s willingness to go to trial if the settlement demand was not met. This substantial recovery is part of a long line of substantial settlements and verdicts obtained by Mr. Slater, who is a widely recognized New Jersey personal injury and medical malpractice lawyer, with extensive experience in cases arising from ophthalmology, Lasik surgery, cataract surgery, eye, cornea, and visual injuries resulting from surgery and accidents, as well as numerous other personal injury, medical malpractice, product liability, and wrongful death cases. Mr. Slater, designated by the New Jersey Supreme Court as a Certified Civil Trial Attorney, has achieved many substantial jury verdicts and settlements in personal injury, medical malpractice, and product liability matters, including recent cases such as an $80 Million Class Action Settlement against an automobile manufacturer, a $14.7 million settlement for a man who suffered neurologic injuries and a condition known as Complex Regional Pain Syndrome/Reflex Sympathetic Dystrophy when he was struck by a car, a $3.85 million settlement on behalf of a child who was given an incorrect medication by a hospital, and a $2 million jury verdict for a woman who suffered pelvic injuries in an automobile accident. 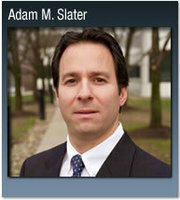 Contact NJ personal injury attorney Adam Slater for a free case evaluation. Featured in the New Jersey Law JournalMr. Slater's $3.9 Million Settlement was featured in the New Jersey Law Journal.